Thanks again to all of the AIA members, participants, vendors, and partners that made their way to the BPI booth this year. What a great show it was! This year was certainly an upswing from the last couple, as the AIA members were attending in full force. We all certainly hope this has to do with the AEC market taking a turn for the better. 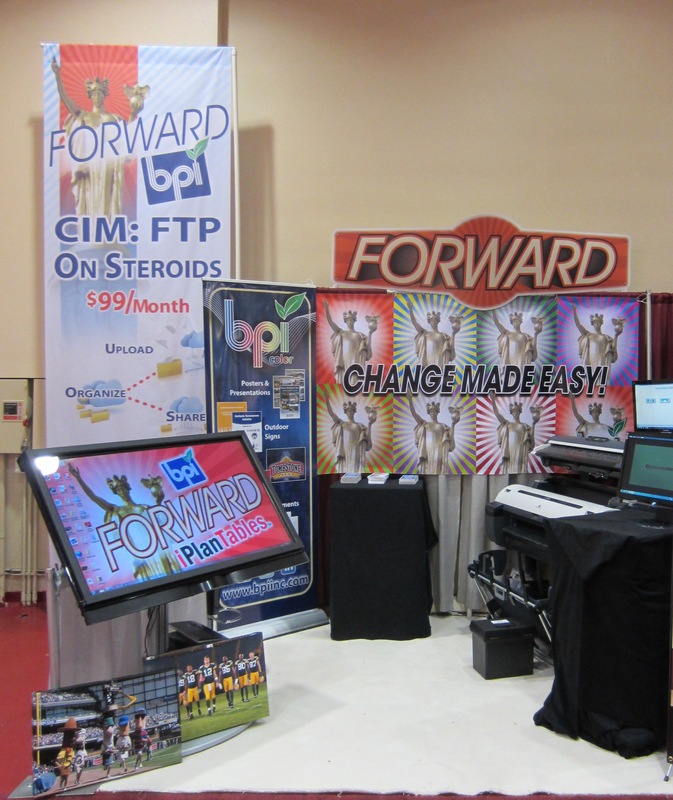 At the BPI booth, we saw a focused interest in the Construction Information Management software solutions. This ranged from online bidding sites to sophisticated software applications which allow you to track workflow documentation on projects from initial design through closeout. However, getting the most attention was the scan to file document site where BPI scans old valuable plan sheets into a portal and delivers the documents in a digital searchable format. We thank everyone for their great feedback and interest in this regard and look forward to cleaning out all those ‘closets’. We also want to call attention to the lucky winners of our Sports Canvas giveaway. The winner of the print and clip coupon giveaway was Bill Simpson of FCM Corporation. Thanks, Bill, and congratulations! Following Bill’s lucky streak with the final 3 giveaways was Steve Harms of Tri-North Builders, Chad Wright of Northwestern Mutual and Jim Fryk of LaMacchia Group. Congrats to all the winners and thank you all for your support at the Expo. Did not attend 2012 AIA? You can still partner with BPI, the complete source for all your large format document needs. Call one of the locations below to find out more about our Color Services, Construction Information Management, or to have a demonstration on the new Canon iPF760 MFP. This is reprinted with permission from Melissa Donovan (mdonovan@rockportpubs.com) from the website Digital Output. Digital Output gives comprehensive coverage on each segment of the printing industry. The articles printed on their site are focused on problem-solving. 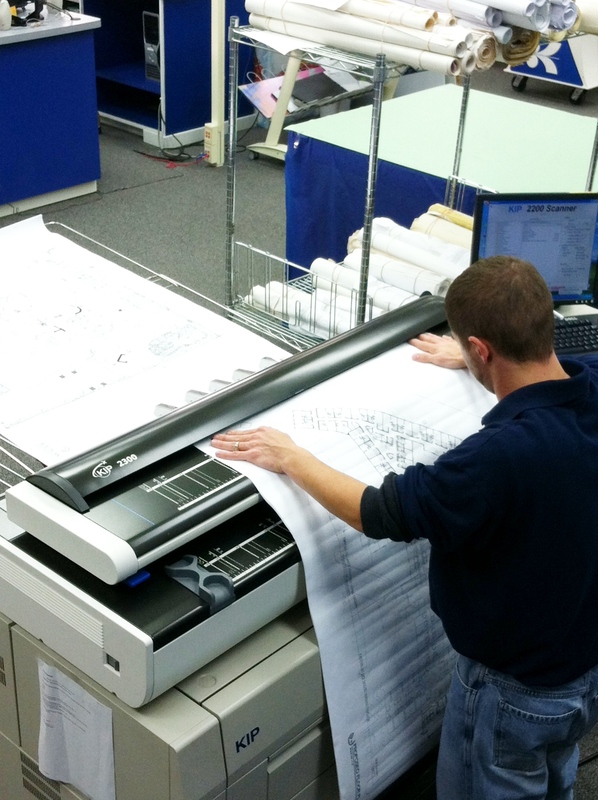 Recognizing the need for a wide format scanner in a print shop means understanding how and why it will be used. More importantly, whether it will engage customers and bring profit to a business is of the utmost importance. Luckily, wide format capture devices provide services for a host of markets from fine art to archiving for healthcare, real estate, government, libraries, or education; CAD; GIS; and architecture. It is important to know which type of wide format scanner is a fit for your business before you purchase. In the case of Milwaukee, WI-based BPI, Inc., the over 50-year-old company supports engineers, architects, and contractors with scanning and printing services as well as being a reseller for the same systems in both black & white and color. At its four locations—all based in WI—the company offers full-color poster printing, presentation boards, outdoor signage, and large and small black & white and color copies and scans of architectural plans, bid documents, and archival support for large commercial and real estate complexes. Each office holds a wide format scanner from KIP. Since 1992, BPI has been a Blue Ribbon Dealer for the company, and in 1998, BPI became a priority-level dealer. In addition, BPI has been a software beta site for KIP since 2005. The shop recognizes the level of scanning technology offered by KIP and how well the devices fit their field of work. They recently instituted the latest KIP scanner, the KIP 2300. With enhanced image capture technology and high-speed processing, the CCD-based color scanner is a workhorse for BPI’s archive services department. In monochrome, it scans up to 12 inches per second at 200 dpi. The typical volume of a scan job for BPI ranges from a couple hundred to thousands of originals. For two to 300 originals, the turnaround time is anywhere from three to five business days and 1,000 originals takes about two to three weeks, but there are factors that weigh heavily on these time frames. According to Steve Mueller, president of BPI, “the condition of the originals and how detailed the client’s scanning requirements affect the timelines.” Once completed, the scans are burned to a CD. Typically, customers request a hard copy of the most heavily used document because the original is so deteriorated. Archiving plays a large part in BPI’s day-to-day services. Sometimes what a customer thinks is a safe and secure method of archiving can be taken a step further, and it is the reprographic shop’s job to educate them. For example, a local facility manager recently requested a multi-page PDF of a roll of drawings, which was completed on the spot while he waited. A week later, Keith Buchman, senior sales representative of BPI, visited the facility manager and discussed the possibility of creating an archive system for its documents and drawings. “They talked about how much more valuable the documents would be if BPI archived them, which would stop the aging process and make all of them easily accessable,” explains Mueller. The initial discussion led to multiple months of capture. At press time, BPI was working with a national client that owns real estate in 21 states and is now receiving five to ten rolls of plans per week for a large format archiving project. To date, this is BPI’s largest archiving client. The original documents differ wildly when it comes to condition. To determine the best scan method, the provider places each document into one of three stages. Stage one is classified as “good to great,” where little to no taping or restoration is necessary. Stage two is “average,” meaning some taping, restoration, and re-scans are required about 25 to 30 percent of the time. Stage three is made up of torn, tattered, water stained, or poorly stored originals that require major taping and restoration. Generally, rescanning is required 90 percent of the time for these originals. After three months, BPI has scanned over 11,000 originals across the three condition stages. Once completed, Mueller estimates they will have scanned 120,000 documents. The KIP 2300 works perfectly for this archive opportunity, as it has the ability to capture every scan at the same archive workstation. Additionally, the scanner captures documents up to 0.6 inches thick, providing an array of possibilities. Advancements in scanning over the last ten years have played a major part in the efficiency and color quality that BPI currently offers its customers. “Ten years ago wide format scanners only had the capability to scan to a resolution of 400 dpi and color systems were outrageously priced. Now, an individual can scan large originals at up to 1,200 dpi on today’s color scanners with awesome detail,” explains Mueller.